CA State Director Patricia Thompson, Jennie Patterson, Doreen Estrada & Bertha Cordaway attended “A Night to Honor Israel” on Sunday November 9 in Sacramento at the Trinity Life Center. 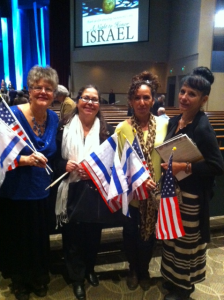 It was a night of beautiful anointed Jewish music, joyful fellowship and education through the speakers. Support for Israel is one of our seven core issues.